It just doesn’t get much better than this optic! 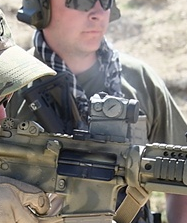 The Aimpoint Micro T-1 is an extremely good option for your close quarters battle (QCB) rifle/carbine. You can pick up a target quickly with the large field of view and shoot with both eyes open. This optic is amazing to use in the field. So let me backtrack now to the “mission” I had defined for anAR-15 optic. Provide clear sight picture for CQB carbine in any light conditions in a lightweight and rugged short to medium range optic. Must be no larger than 2 – 4 MOA dot size. If it uses a battery, battery must be good for at least 1+ years minimum. Fully adjustable dot brightness for use in low-light or bright desert daytime. 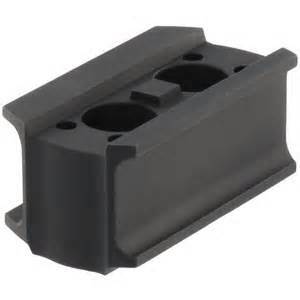 I did my research and came up with the Aimpoint Micro T-1 optic in the 2MOA version. The Micro T-1 also comes in a 4MOA version. I shopped around and got the best deal I could for two since I had already made my “buy” decision. The day they arrived on my doorstep I was giddy like a little kid at Christmas, and for good reason. I had also ordered one A.R.M.S. #31 quick release mount along with a LRP mount so I could try both styles/types. Since these T-1’s were going on AR-15s with the fixed blade front sight I also ordered two high micro risers/spacers (39mm) to enable co-witnessing. I assembled the two different optic packages with ease and quickly. Anyone, even a novice, can assemble these packages with not problems in minimal time. Just follow the instructions carefully and don’t get in a rush. I installed each optic on its respective AR-15 and was very impressed with their “look.” What I am saying is they looked as if they belong on a solid battle platform. Now it was off to the range. But, before going I had taken initial steps to sight them in using a bore sight system. Once at the range it took me no more than six rounds to “dial-them-in” with no problems of any kind. 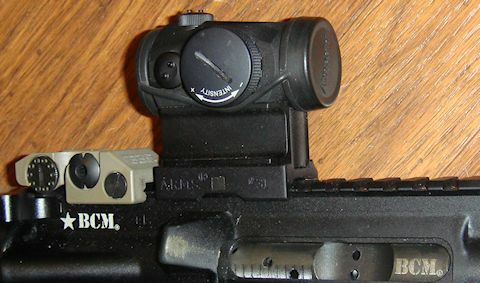 The windage and elevation is easily adjustable with either the special tool that comes with the sight or the turret caps. I tried a number of different dot light settings and found almost all of them perfectly usable in bright desert conditions. That was two years ago. We’ve have punched about 3,000 rounds through each AR since then and have never had to re-sight the Aimpoint. And here is a real test of the entire optic package – I took the optic off the weapon and then reattached it. It maintained its “zero” perfectly. I have done that maybe 3 times over the last two years and it has maintained “zero” with no problems and no adjustments. I am not easy on my weapons, I train with them just as I would fight with them. It has taken some bumps, bruises, and a drop. That optic never even blinked! This thing is rock solid and ready for the field; it can handle anything I can do to it. It is lightening fast picking up targets. I used this carbine and optic in a tactical carbine class a year ago and I was amazed at how easy it was to acquire, track and maintain your target picture. This ultra-compact optic is ultra-rugged as well. A comment about weight – I custom built two AR’s for my wife and I. I built them as light as possible, and I mean light, super-light. Why? Well, if you have ever had to carry an rifle for any length of time you will come to appreciate “lightweight.” Wearing a full kit and battle load of ammo can be daunting and physically demanding. I wanted two rifles that would be as least taxing on my wife and I as possible. The Micro T-1 weighs just 3ounces by itself, under 4ounces with the highrise and quick-release mounting base. Now that is light!! Note of particular interest – the Micro T-1 has been adopted as the primary optic by USAF para rescue jumpers and Dutch KSK special forces. Many US Army units have adopted them as their optic of choice as well. 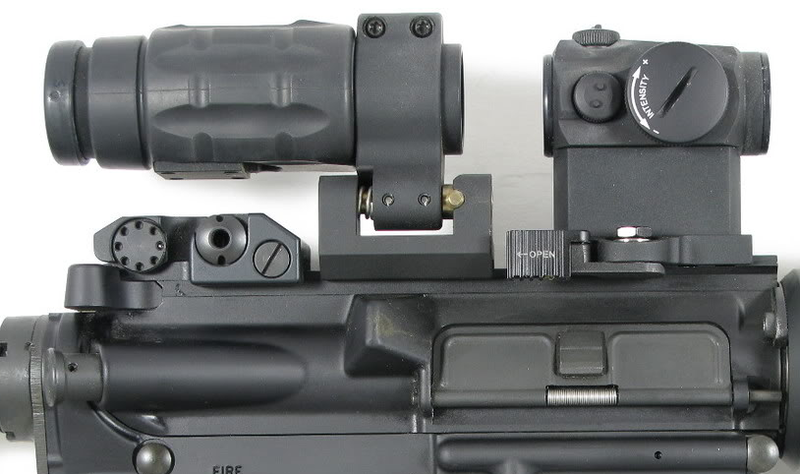 You can also pair the Micro T-1 with the Aimpoint 3xMag magnifier on the Aimpoint TwistMount. So here are some technical details and information on this amazing piece of weapon’s gear. 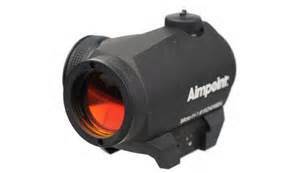 The Aimpoint Micro T-1 is ideal as a standalone sight, and can also be piggybacked on top of larger magnifying scopes, night vision, or thermal imaging optics. 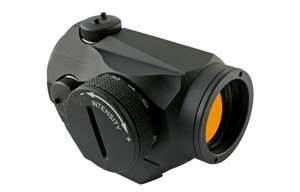 The performance of the Micro T-1 is optimized for use with all generations of Night Vision Devices (NVDs), but is ideal for 3rd and 4th generation night vision technology. Water resistance – submersible to 80ft. Aimpoint Micro T-1 is the optic for you! 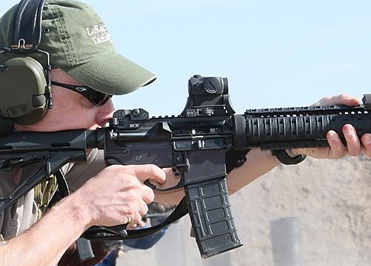 This entry was posted in Guns & Gun Gear. Bookmark the permalink.